The decision was taken by the Government of Liberia to reduce the tariff on chicken feet, pig feet, vegetable oil, and mosquito coil that are on a list of 2,000 commodities affected by the decision is yielding little or no impact as prices continue to increase. President George Weah on May 24 of this year gave a three-day ultimatum to the Liberia Revenue Authority (LRA) to reduce tariff on 2,000 commodities. The move was to ease the economic burden on ordinary Liberians, who buy these items on a daily basis. But the intention behind the reduction is still far from been met as the price of these items still remain the same or increasing day-by-day. At the same time, the government is yet to release a full list of the 2,000 commodities it claimed that the tariff reduction affected. Some Liberians are blaming the situation on the devaluation of the Liberian dollar against the US dollars, while others are arguing that the government’s decision to cut tariff without assessing the impact was a misstep. 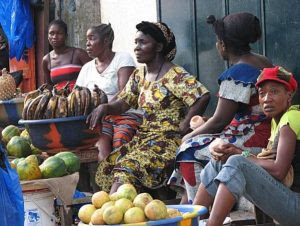 Speaking to FrontPage Africa, a cross-section of Liberian business people in the Red Light, Duala and Gardnersville markets expressed frustration about the increased in prices of commodities that tariff cut affected. Some marketers called on the Weah-led government to put “words into action” by demanding major importers to adhere to government’s mandate. Abraham Mulbah, a shop owner in the Duala market, complained about the difficulties he now goes through on a daily basis since the reduction of the tariff was made public by the Ministry of Information. He said customers keep arguing with him, complaining why he is still selling at the same price when the tariffs have been reduced. “Every day my customers keep asking me about the price of things that tariff was reduced on, when I tell them it is the same, some of them find it hard to believe it,” explains Mulbah. Mulbah suggests that in order to bring stability to the business sector the government must enforce the idea behind the tariff reduction. Kebbeh Kollie is a retailer of imported chicken and chicken feet at the Chicken Soup Factory market along the Somalia Drive renamed Japan Freeway. Her customers have reduced since the tariff reduction on the 2,000 commodities was announced by the government. Kebbeh says some of her customers have changed their diet because of the high price of chicken, chicken feet and pig feet. “The number of customers that are used to receive during a day’s time has drop, in fact, most of my customers prefer buying fish instead of the chicken feet or the pig feet,” she said. In the busy Red Light Market District, Hawa Morris, owner of a shop, is also feeling the pinch of the tariff cut, and she wants the government to engage importers of these commodities to ascertain the cause of the unchanged prices despite the reduction of taxes. “The government needs to sit down with these importers and discuss the issues still behind the higher price after the announcement has been made on the reduction of tariff on items like vegetable oil, mosquito coil, chicken feet and other goods,” she said. Mohammed Sesay, a petty trader in the Red Light Market, says the high prices of commodities that tariff was reduced on is an early sign that the George Weah-led government is not in control of the economy just like the previous government. “If this government will sit and allow importers, who are mainly foreigners, to still sell goods at a higher price after tariff have been reduced on them, then they do not mean well for this country,” Sesay claims. Vambah Duckly, another retailer in Duala Market, alleges that the tariff reduction was only intended to enrich the importers and not the petty traders or the ordinary citizens. “The tariff reduction is not having any effect positively on the ordinary citizens as it supposed to be instead it is those foreign importers who are benefiting from the tariff reduction,” he said. “So, this government headed by President George Weah needs to derive measures to ensure the survivor of Liberian businesses who does not have the financial strength to compete with the foreigners”.